The February Revolution had brought about some radical shifts in the correlation of Russia’s main political forces, affecting the standing of different parties. Monarchist groupings, in particular, had been quickly swept away by its tide, while the significance of parties which used to be close to monarchists, such as the Octobrists, was greatly diminished. By contrast, the liberal Kadets were swiftly transformed from a party of the opposition into a ruling party, while the Socialist-Revolutionaries and the Mensheviks were content to take on the role of constructive opposition. The singularity of the February Revolution, however, was in the way in which it had resolved the most cardinal question of any revolution - the question of power: who would pick up the reigns of government after the old authority had collapsed? In Russia two governments simultaneously had emerged contending for the right to provide political leadership after the fall of tsarism: the liberal Provisional Government which officially held the reigns of power, and the unofficial government in the form of the Petrograd Soviet of Workers’ and Soldiers’ Deputies supported by the armed workers and soldiers of the capital. The Soviet had been established on the initiative of socialist intellectuals who had been very imperfectly represented in the Fourth Duma. They saw the formation of the Provisional Government by the Duma as a challenge to themselves and decided to set up a separate governing body. They already had a model of a quasi-governmental working-class organization in the earlier St Petersburg Soviet, established in October of 1905 and suppressed by the government in December of that year, and this they decided to revive. 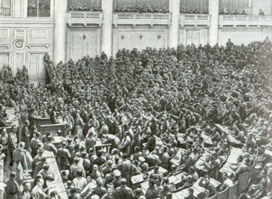 Hasty elections were arranged by the socialists at various factories and military barracks of Petrograd and on 27 February the Petrograd Soviet was set up as a rival governing authority. Most members of the Soviet were Mensheviks and Socialist-Revolutionaries with the Bolsheviks numbering some 10 percent of the delegates. The Executive Committee of the Soviet was composed predominantly of Menshevik intellectuals. This simultaneous formation of the Provisional Government, on the one hand, and the second alternative government in the form of the Soviet, on the other, brought about the situation of ‘dual power’, under which the ‘bourgeois’ Provisional Government had to co-ordinate its decisions and share power with the ‘proletarian’ Petrograd Soviet. The unstable situation of ‘dual power’ characterized almost the whole of the period of several months leading to October 1917, during which Russia, with no head of State, had two governing bodies: one enjoyed formal authority without power, while the other had power without formal authority. The Provisional Government had the support mostly of Russia’s traditional elites, as well as the remnants of the tsarist bureaucracy and the high command in the army. The Petrograd Soviet commanded the loyalty of urban workers and peasants, and spread its authority over other Soviets which sprang up in the towns and villages and at the front. From the outset, the Provisional Government was dependent on the goodwill of the Soviet, which expressed the distrust of the worker and soldier ‘masses’ towards the ‘bourgeois’ and ‘capitalist’ ministry.